Today, UN Secretary-General Ban Ki-moon will pay a visit to Auschwitz where he will make a show of concern for the demonization of Jews in the past century. However, at the very same time his UN staff is actively discriminating against Jews at UN Headquarters in the here and now. On Friday, November 15, 2013, an official UN-accredited Jewish non-governmental organization had its security clearance to attend an open UN meeting in New York revoked at the behest of the UN Division for Palestinian Rights. The group of 18 Birthright Israel alumni had been invited to witness the annual offensive “UN Day of Solidarity with the Palestinian People” by the UN-accredited Touro Institute on Human Rights and the Holocaust. The annual event marks the anniversary of November 29, 1947, the day that the UN General Assembly adopted a resolution which partitioned Palestine into a Jewish and an Arab state. It was a resolution accepted by Jews and rejected across the Arab world. It was also a day celebrated by the victims of the Nazis and the Jewish people in their ancient homeland and around the world. But not by the modern United Nations. Former secretary-general Kofi Annan characterized it as “a day of mourning and a day of grief,” and every year under UN auspices, member states and NGOs gather to mourn the creation of the Jewish state. This year, the admission passes of the Jewish group had been officially approved, security clearance had been granted, and the passes were scheduled to be picked up. That is, until UN security official Lt. Paul Jankowsky reversed course and unilaterally decided that the chief of the UN Palestinian Rights Division, Wolfgang Grieger, had a veto over who could attend. Jankowsky and Grieger’s interference occurred despite the fact that the meeting was clearly advertised on the UN’s own website with the simple statement: “NGOs are invited to attend.” Furthermore, an open invitation announcing the date, time and place had been advertised with no restrictions of any kind in the UN’s Daily Journal of the very same day, November 15. In 2005, the UN marked Palestinian Solidarity Day by displaying a map of the region which was missing the UN member state of Israel. After the embarrassing map was photographed, and a letter of objection sent from American UN ambassador John Bolton to then secretary-general Annan, the map was not shown again. But instead, every year the UN meeting room holding the event is decorated with only two flags – the flag of the United Nations and the flag of “Palestine.” The flag of Israel is never flown, notwithstanding that the 1947 resolution commits the UN to a two-state solution. Palestinian Solidarity Day is a major event in the UN calendar. Speeches in New York are given by each of the president of the general assembly, the president of the Security Council and the secretary-general. Also in attendance, and welcomed with open arms, are selected NGO extremists and representatives of so-called “civil society” who are prepared to contribute to the ritual demonization of Israel. An example of the kind of person who makes the cut of the UN Division for Palestinian Rights is Roger Waters, who represented civil society at last year’s event. He accused Israel of “ethnic cleansing,” voiced his support for boycott, divestment and sanctions (BDS) campaigns, claimed “Hamas is open to permanent peace with Israel,” and even demanded the General Assembly terminate the membership of Israel in the UN until its “illegal apartheid regime” ends. Undoubtedly, the Division for Palestinian Rights will have hand-picked another such “civil society” representative to grace this year’s event, which will take place on November 25 because of Thanksgiving in the US. 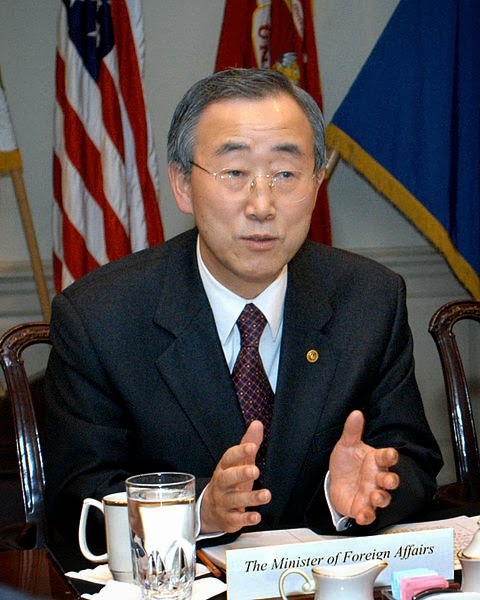 Ban Ki-Moon is scheduled for a photo op at Auschwitz. Today in Poland the secretary-general will pose for the cameras at Auschwitz and the UN media machine will move into high gear. One week today in New York, the secretary-general will bar selected Jews from attending a public UN meeting and deliver a statement marking the partition vote absent the flag of the Jewish state. The duplicity could not be clearer. Technorati Tag: Israel and UN and United Nations and Ban Ki-Moon.